I'm glad you're here, let's do this together! Need some resources to get started? I got you, mama! Download any or all of my resources below! "within 6 weeks I had 3 retainer clients"
"within three months... I had exceeded my full-time income and resigned from my job!" I landed two retainer clients!" "in less than 3 months was making over $2,500 working part-time hours from home!" Micala's course is truly amazing, and life changing. She gives detailed, step-by-step actions to take to start your freelancing business all while providing a ton of on-going support. Her authenticity is refreshing, and I adore the community she has created. I am empowered to work how I want, grow a successful business, and live the life I want because of her course! I have all the tools I need, all in one place... in fact, I haven't even been able to fully capitalize on all her amazing tips and information, because I'm too busy now doing client work! The ROI came quickly, and so did the transition of being "overwhelmed" to being "overbooked." I am forever grateful for this course!! I can't say enough good things about Micala's course. In less than three months after signing up, I have multiple clients on monthly retainers and I'm loving my WAHM life! Beginning your freelance journey is hard work, but Micala, her course, and her Facebook group support make it SO much easier to navigate! 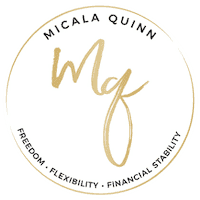 If you are looking to start a freelance business and you want to hit the ground running with the best information, Micala and a group of other ladies cheering you on and all the help you need this is the course for you. I have purchased and completed several courses online and this remains my favorite and most life-changing. Highly recommend! Overwhelmed to overbooked is not just a course but a support system. The course itself takes the process of becoming a freelancer and breaks it down into small steps instead of a giant mountain. Micala is always there, whether it's the course videos, FB or podcast encouraging but also giving a firm push in the right direction.